The work/pottery that I make, I try to keep as simple as possible. I think that the form and the function of the piece should be complemented by the surface. Whatever you feel from the piece and however you connect to it should come from within the piece itself. The combination of form, surface decoration, glaze and firing should all combine to make a piece that will cause you to react to the whole rather than to one specific aspect of the piece. Because my shapes and surfaces are simple, I hope that whoever looks at them is inspired to use them in their own way. Making work for big competitions is fine for some but doesn’t hold much interest for me. Although I was an apprentice to a potter who is famous for his Mingei ware, I really don’t consider that much in my own work. I don’t conscientiously think of what I make as being physically connected to the Mingei tradition, even though it is. 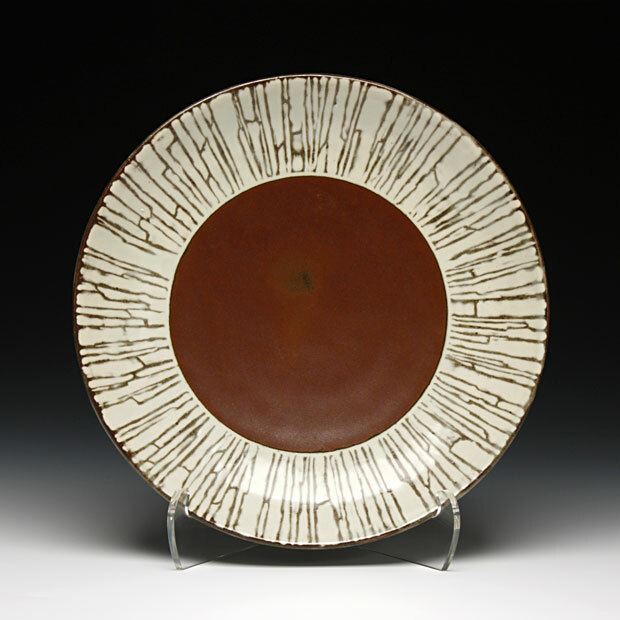 I feel I am connected to the ideals of Mingei. My focus lies in making work that is strong and truly functions well. I try to make work that is reasonable in price so that anyone can afford it. I want to try and make the best work that I can. By doing so and by having people use my work, it is a way to get a bit of art into people’s everyday lives.